I wanted a concrete parking pad (appx. 35x20 ft) poured where crusher run gravel existed previously. There were some challenges to angle the new concrete to channel water away from a laid brick area adjoining the house. I'm pleased with how that problem was solved as well. They left the area clean and even spread and packed the removed crusher run on the gravel part of my driveway. I'm very pleased with their work and the result! Bob & his team are passionate about their work and take oustanding care of their customer. My wife and I had been looking to add a patio extension to our exisiting patio. After reaching out to several companies, Bob and his team were the obvious choice. From start to finish it was evident Bob and the team took great pride in their work; ensuring the finished product met their high standard and exceed my expectations. Bob went above and beyond to ensure my satisfaction. During the follow up walk through we encounterd an issue with an exsisting screen door not being able to open properly. Although the screen door work was installed by another company; Bob righted the situation and he himself removed and re-installed the screen door allowing it to function properly. It's rare you find a company like "a little concrete" now-a-days; but I can assure you, you WILL be satisfied with their work; their people, and their committment to your satisfaction. "We hired A Little Concrete to put in a stamped concrete patio in the corner of our house, an area that was congested with trees, utilities, and water drainage problems. A Little Concrete effectively worked around all of those impediments to construction. We then found that if A Little Concrete didn't get some detail right, they didn't give us the runaround or excuses-they just made sure we were satisfied for the price they had quoted. 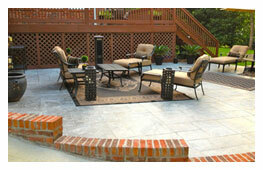 We now have a beautiful patio that not only looks good but functionally drains water perfectly." "This company put in a double driveway for me.These folks do very good work at a reasonable price .I am a very hard person to please and to my delight they did a perfect job .B K is a person of great integrity and does exactly what he says with no surprises .I will be glad for any person to come by my house and view the finished product."